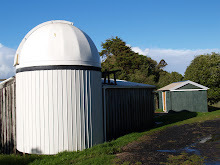 Kumeu Observatory Log: New Bearings! So after a careful examination of the dec drive assembly from the paramount, Auckland Astronomical Society's engineering wiz, Graham Beazley removed the bearings from the assembly, and after a quick trip to Saeco had new bearings for just $17+GST. Graham reassembled and adjusted the tension and it looks like the assembly is now back in business. Hopefully we'll get this reinstalled in the mount in the next few days and will then be ready to get the system backup and running again !